Hear ye, Hear ye…What’s new at the Library! We are lucky to have the High School Art students’ entries from the High Plains League Art Show in the Pinnick Room. Mrs. Lynnette Gonzalez, USD 226 Art Instructor and her students have been very gracious in the last three years to allow MPL to display their pieces. Again this year we will give a People’s Choice Award to the favorite piece of the show. Stop by and see the amazing art and vote for your favorite! On display until April 24th, so don’t delay! 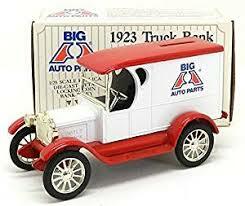 In our lighted display case we are highlighting Car and Truck banks collected by Jack Shelton throughout his life. Cheryle Shelton was willing to bring in some of the many banks he collected for our case. There are some intriguing pieces on display!